I was in the gym for a late afternoon workout yesterday. Surprisingly, the gym was really slow. I wasn’t able to get there until about 4:45 PM because I had a hectic day. I’m experimenting with a 6-day approach. The workouts are really, really short, so I’m in and out of the gym pretty quickly. I like it because I’ve given myself the option to combine two workouts into one if I can’t make it to the gym the next day. Ran Home (it’s just a little over a mile… I think). Good times. Unfortunately, I saw a guy holding a 45 lb plate doing that Side Bend exercise. You know which one I’m talking about, right? C’mon, I thought we were past that. The best ab exercises are done without wreaking havoc on your back and neck. 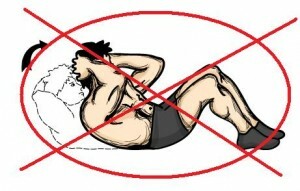 That means no side bends or crazy crunches or sit-ups. I’m talking about the stability ball jackknife, the variety of planks, Spiderman climb, etc., etc. When I write my ab finishers, I like to use “Total Body Ab” exercises, along with direct core work. That way, you burn calories to burn off the flub, and the direct core work is to start the chiseling. But hear me out – it starts AND ends with the diet. So, if you’re not willing to invest yourself in a good diet, then don’t even bother with ab finishers. That is politically incorrect, but it’s the truth. There are some great programs out there, including Brad Pilon’s Eat Stop Eat program, Isabel’s Diet Solution Program and Dr. Peter Osborne’s Gluten-Free Health Solution. These are all great programs to create a healthier lifestyle and a calorie deficit. Do the above superset 5 times, resting for 20 seconds between supersets. By the way, this is much tougher than it looks. After getting feedback from clients and testing it myself, I reduced the reps by 2 (it was originally 10) and then I added a round. The short rest period is what makes it challenging. 20 seconds isn’t long at all. It’s starting to get ridiculous… and that’s the way uh-huh, uh-huh I like it. Finally, here’s a countdown finisher hitting the core pretty hard. It’s one I’ve been doing with a one-on-one client and it’s more brutal than what it looked like on paper. Do the following superset only resting when needed (try to get through the entire finisher without resting – you’ll end up speaking in tongue). In the first superset, you will perform 6 reps. In the next superset, you will perform 5 reps. Continue in this fashion until you complete 1 rep of each exercise. Speaking of countdown (or ladder) finishers, try this dandy one below. This is a very advanced finisher – so don’t be afraid to start at 6 instead of 8, and then work your way up to 8. The Lunge Jumps alone are ridiculous. By the way, sorry for the quality of the video.. what happened?… who knows. May you never, EVER get bored with your workouts and burn more fat in less time.